Well, I am more than excited to tell you about it! 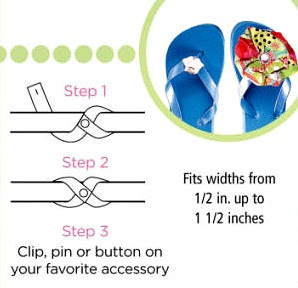 Accessory Connectz is a new & simple way to jazz up your flip flops, headbands, belts, pet collars & more. These little straps act as a multi-functional accessory mount. Have a new look everyday of the week! You simply secure the straps to your desired item....Clip, Pin or Button on your favorite accessories! Things such as hair bows, flower clips & pins, sports pins, broaches & more! They are switchable, attachable and interchangeable all in one! Watch this short 3 minute video and I think you will be as excited about Connectz as I am! My grand daughters loved these! They had so much fun with these and loved the idea that they could add flowers to their flip flops! I just had to share one of my favorite things in the catalog. I love these bridal accessories. Aren't they the cutest things ever! Please go through the catalog and let me know what your favorite is. I received Accessory Connectz to review and all opinions are 100% my own.